The Big Ten Conference (B1G), formerly Western Conference and Big Nine Conference, is the oldest Division I collegiate athletic conference in the United States. The conference, consisting of 14 members as of 2016, competes in the NCAA Division I; its football teams compete in the Football Bowl Subdivision (FBS), formerly known as Division I-A, the highest level of NCAA competition in that sport. The conference includes the flagship public university in each of 11 states stretching from New Jersey to Nebraska, as well as two additional public land grant schools and a private university. The Big Ten Conference was established in 1895 when Purdue University president James H. Smart and representatives from the University of Chicago, University of Illinois, University of Michigan, University of Minnesota, Northwestern University, and University of Wisconsin gathered at Chicago's Palmer House Hotel to set policies aimed at regulating intercollegiate athletics. In 1905, the conference was officially incorporated as the "Intercollegiate Conference Athletic Association". Big Ten member institutions are predominantly major flagship research universities with large financial endowments and strong academic reputations. Large student enrollment is also a hallmark of Big Ten universities, as 12 of the 14 members feature enrollments of 30,000 or more students. Northwestern University, one of just two full members with a total enrollment of fewer than 30,000 students (the other is the University of Nebraska–Lincoln), is the lone private university among Big Ten membership (the University of Chicago left the conference shortly after co-founding it.). Collectively, Big Ten universities educate more than 520,000 total students and have 5.7 million living alumni. Big Ten universities engage in $9.3 billion in funded research each year. Though the Big Ten existed for nearly a century as an assemblage of universities located primarily in the Midwest, the conference's geographic footprint now spans from the state of Nebraska in the west to the Atlantic Ocean in the east. Big Ten universities are also members of the Big Ten Academic Alliance, an academic consortium. In 2014–2015, members generated more than $10 billion in research expenditures. Despite the conference's name, the Big Ten has grown to fourteen members, with the following universities accepting invitations to join: Pennsylvania State University in 1990, the University of Nebraska–Lincoln in 2011, and both the University of Maryland and Rutgers University in 2014. Johns Hopkins University was invited in 2012 to join the Big Ten as an associate member participating in men's lacrosse only. In 2015, it was also accepted as an associate member in women's lacrosse. Notre Dame is scheduled to join the Big Ten in 2017 as an associate member in men's ice hockey. ↑ On July 1, 2014, Johns Hopkins University joined the conference as an associate member in men's lacrosse. On July 1, 2016, the school also became an associate member in women's lacrosse. ↑ Notre Dame will be joining the conference as an associate member of men's ice hockey starting with the 2017–18 season. * Notre Dame will join the Big Ten in the 2017–18 school year as an affiliate member in men's ice hockey. It continues to field its other sports in the ACC except in football where it will continue to compete as an independent. ↑ Fencing is officially a coeducational team sport, although a few schools field only a women's team. Ohio State and Penn State, like most NCAA fencing schools, have coed teams, while Northwestern fields only a women's team. ↑ The only category of rowing that the NCAA governs is women's heavyweight rowing. Women's lightweight rowing, as with all men's rowing, is governed by the Intercollegiate Rowing Association. ↑ Unlike rifle, pistol is not an NCAA-governed sport. It is fully coeducational. ↑ Rifle is technically a men's sport, but men's, women's, and coed teams all compete against each other. Nebraska fields a women-only team, and Ohio State fields a coed team. ↑ Synchronized swimming is not governed by the NCAA. Collegiate competition is governed by United States Synchronized Swimming, the sport's national governing body. The conference was again known as the Big Nine after the University of Chicago decided to de-emphasize varsity athletics just after World War II. Chicago discontinued its football program in 1939 and withdrew from the conference in 1946 after struggling to obtain victories in many conference matchups. It was believed that one of several schools, notably Pittsburgh, Nebraska, Michigan State, Marquette, Notre Dame, and Iowa State would replace Chicago at the time. On May 20, 1949, Michigan State ended the speculation by joining and the conference was again known as the Big Ten. The Big Ten's membership would remain unchanged for the next 40 years. The conference's official name throughout this period remained the Intercollegiate Conference of Faculty Representatives. It did not formally adopt the name Big Ten until 1987, when it was incorporated as a not-for-profit corporation. Big Ten logo (1990–2011). To reflect the addition of the 11th school, Pennsylvania State, the number 11 was disguised in the negative space of the "Big Ten" lettering. 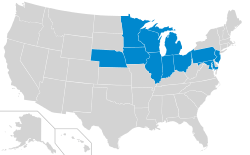 In 1990, the Big Ten universities voted to expand the conference to 11 teams and extended an invitation to Pennsylvania State University, which accepted it. When Penn State joined in 1990, it was decided the conference would continue to be called the Big Ten, but its logo was modified to reflect the change; the number 11 was disguised in the negative space of the traditionally blue "Big Ten" lettering. Missouri showed interest in Big Ten membership after Penn State joined. Around 1993, the league explored adding Kansas, Missouri and Rutgers or other potential schools, to create a 14-team league with two divisions. These talks died when the Big Eight Conference merged with former Southwest Conference members to create the Big 12. Following the addition of previously independent Penn State, efforts were made to encourage the University of Notre Dame, at that time the last remaining non-service academy independent, to join the league. Early in the 20th century, Notre Dame briefly considered official entry into the Big Ten but chose to retain its independent status. However, in 1999, Notre Dame and the Big Ten entered into private negotiations concerning a possible membership that would include Notre Dame. Although Notre Dame's faculty senate endorsed the idea with a near-unanimous vote, the school's board of trustees decided against joining the conference. Notre Dame subsequently joined the Atlantic Coast Conference in all sports except football, in which Notre Dame maintains its independent status as long as it plays at least five games per season against ACC opponents. This was believed to be the major stumbling block to Notre Dame joining the Big Ten, as Notre Dame wanted to retain their independent home game broadcasting contract with NBC Sports, while the Big Ten insisted upon a full membership with no special exemptions. On September 1, Delany revealed the conference's divisional split, but noted that the division names would be announced later. Those division names, as well as the conferences new logo, were made public on December 13, 2010. For their new logo, the conference replaced the "hidden 11" logo with one that uses the "B1G" character combination in its branding. Delaney did not comment on the logo that day, but it was immediately evident that the new logo would "allow fans to see 'BIG' and '10' in a single word." For the new division names, the Big Ten was unable to use geographic names, as used by the SEC, because they had rejected a geographic arrangement. Delaney announced that the new divisions would be known as the "Legends Division" and "Leaders Division". In the Legends division were Iowa, Michigan, Michigan State, Minnesota, Nebraska and Northwestern. The Leaders division was composed of Illinois, Indiana, Ohio State, Penn State, Purdue and Wisconsin. Conference officials stated they had focused on creating competitive fairness rather than splitting by geographical location. However, the new "Legends" and "Leaders" names were not met with enthusiasm. Some traditional rivals, including Ohio State and Michigan, were placed in separate divisions. For the football season, each team played the others in its division, one "cross-over" rivalry game, and two rotating cross-divisional games. At the end of the regular season the two division winners met in a new Big Ten Football Championship Game. The Legends and Leaders divisional alignment was in effect for the 2011, 2012, and 2013 football seasons. On March 23, 2016, the Big Ten Conference and Notre Dame announced the Fighting Irish would become a men's ice hockey affiliate beginning with the 2017-18 season. Notre Dame's team is currently a member of Hockey East, and the move will save them from longer trips to New England while renewing rivalries that existed in the CCHA and WCHA. In 2012, the conference announced it would move its headquarters from its location in Park Ridge, Illinois to neighboring Rosemont by the end of 2013. The new office building is situated within Rosemont's MB Financial Entertainment District, alongside Interstate 294. The move into the building was finalized on October 14, 2013. Eleven of the thirteen public schools in the Big Ten (Purdue and Nebraska excepted) are considered "Public Ivies" (although Purdue is often ranked in the top half of the Big Ten and many of its programs are in the top ten nationally). Each Big Ten institution (Nebraska excepted) is a member of the American Association of Universities and is ranked in the US News & World Report top-100 and the Times Higher Education top-200. Nebraska joined the AAU in 1909 but was removed in April 2011 when the AAU disallowed University of Nebraska Medical Center data points to be included in the AAU formula and began to decrease the weight given to agricultural research. Commissioner Jim Delany stated that Nebraska's removal from the AAU would have no bearing upon their Big Ten membership. Nebraska does, however, lead the NCAA with a record of 314 Academic All-Americans (followed by Notre Dame with 221). Currently, no Division I conference is composed exclusively of AAU members. However, the University Athletic Association, a Division III conference is composed of entirely AAU members. All Big Ten members are members of the Big Ten Academic Alliance (BTAA), formerly known as the Committee on Institutional Cooperation (CIC), an academic consortium which allows students at Big Ten institutions to take distance courses at other participating institutions. Students at participating schools are also allowed "in-house" viewing privileges at other participating schools' libraries. The BTAA also employs collective purchasing, which has saved member institutions $19 million to date. The University of Chicago, a former Big Ten Conference member, was a member of the CIC from 1958 to June 29, 2016 (when it was renamed the Big Ten Academic Alliance). Through the sports year ended July 1, 2015, per published NCAA summary, with updates for the subsequent sports year. ^ Johns Hopkins was added in 2014 as an associate member that competed in men's lacrosse only. Johns Hopkins also began competing as an associate member in women's lacrosse in the 2016–17 school year. ^ Maryland won 192 conference championships as a member of the Atlantic Coast Conference (ACC), second most in ACC history. ^ Nebraska won 80 conference championships as a member of the Big 12 Conference, second most in Big 12 history. Nebraska also won 230 conference championships as a member of the Big Eight Conference, the most in Big 8 history. ^ Penn State won or shared 70 conference championships as a member of the Atlantic 10 Conference (1982-91) and earlier when it was known as the Eastern 8 Conference (1976-79). 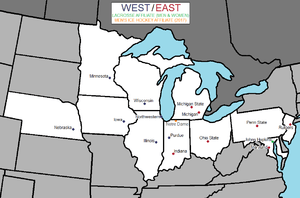 When Maryland and Rutgers joined the Big Ten in 2014, the division names were changed to "East" and "West", with Purdue and the six schools in the Central Time Zone in the West and Indiana joining the remaining six Eastern Time Zone schools in the East. The only protected cross-division game is Indiana–Purdue. Beginning in 2016, the Big Ten will adopt a nine-game conference schedule. Also starting in 2016, the Big Ten will no longer allow its members to play Football Championship Subdivision teams, and will also require at least one non-conference game against a school in the Power Five conferences (ACC, Big 12, Pac-12, SEC). At the time this policy was first announced, games against FBS independents Notre Dame and BYU would automatically count toward the Power Five requirement. Additionally, Big Ten teams that were already under contract to play teams in the "Group of Five" leagues (American, C-USA, MAC, MW, Sun Belt) will be allowed to honor those contracts. As of 2015, three Big Ten members had American member Cincinnati on their future schedules, one had fellow American member Connecticut on its future schedule; and one had future games scheduled against both. ESPN, citing a Big Ten executive, reported in 2015 that the Big Ten would allow exceptions to the Power Five rule on a case-by-case basis, and also that the other FBS independent at that time, Army, had been added to the list of non-Power Five schools that would automatically be counted as Power Five opponents. Since 1946, the Big Ten champion has had a tie-in with the Rose Bowl game. Michigan appeared in the first bowl game, the 1902 Rose Bowl. After that, the Big Ten did not allow their schools to participate in bowl games, until the agreement struck with the Pacific Coast Conference for the 1947 Rose Bowl. From 1946 through 1971, the Big Ten did not allow the same team to represent the conference in consecutive years in the Rose Bowl with an exception made after the 1961 season in which Minnesota played in the 1962 Rose Bowl after playing in the 1961 Rose Bowl due to Ohio State declining the bid because of Ohio State faculty concerns about academics. Due to their "Rose Bowl or bust" policy, the 1972, 1973 and 1974 Michigan squads did not play in bowl games despite posting 10 wins in each season. The Big Ten has participated in basketball since 1904, and has led the nation in attendance every season since 1978. It has been a national powerhouse in men's basketball, having multiple championship winners and often sending four or more teams to the NCAA Men's Basketball Tournament. Previous NCAA champions include Indiana with five titles, Michigan State with two, and Wisconsin, Michigan, and Ohio State with one each. Maryland, which joined the Big Ten in 2014, won one NCAA championship as a member of the ACC. Ohio State played in the first NCAA tournament national championship game in 1939, losing to Oregon. Despite this, Jimmy Hull of Ohio State was the first NCAA tournament MVP. The first three tournament MVPs came from the Big Ten (Marv Huffman of Indiana in 1940 and John Katz of Wisconsin in 1941). Big Ten teams have also experienced success in the postseason NIT. Since 1974, 13 Big Ten teams have made it to the championship game, winning nine championships. Michigan, Ohio State, and Minnesota have won two NIT championships, while Indiana, Penn State, and Purdue have won one each. Two other current members, Maryland and Nebraska, won NIT titles before they joined the Big Ten. In addition, the Helms Athletic Foundation recognizes Illinois as the 1915 National Champions, Minnesota as the 1902 and 1919 National Champions, Northwestern as the 1931 National Champion, Purdue as the 1932 National Champions, and Wisconsin as the 1912, 1914 and 1916 National Champions. Former member Chicago won a post-season national championship series in 1908. Since 1999, the Big Ten has taken part in the ACC–Big Ten Challenge with the Atlantic Coast Conference. The ACC holds a 10–4–2 record against the Big Ten; Minnesota, Nebraska, Purdue, and Rutgers are the only Big Ten schools without losing records in the challenge. 1 2 Participation vacated due to major NCAA violations. ↑ Participation and title vacated due to major NCAA violations. Women's basketball teams have played a total of ten times in the NCAA Women's Division I Basketball Championship (since 1982) and Women's National Invitation Tournament Championship (since 1998). Purdue is the only current Big Ten member to have won the NCAA women's basketball national title while a member of the conference. Both schools that joined in 2014, Maryland and Rutgers, won national titles before joining the Big Ten—Rutgers won the final AIAW championship in 1982, when it was a member of the Eastern 8, and Maryland won the NCAA title in 2006 as a member of the ACC. Big Ten women's basketball led conference attendance from 1993–1999. The Big Ten began sponsoring men's ice hockey in the 2013–14 season. The inaugural season includes 6 schools: Michigan, Michigan State and Ohio State joined from the disbanded CCHA; Minnesota and Wisconsin joined from the WCHA; and Penn State joined after playing its first NCAA Division I season (2012–2013) as an independent. Notre Dame will be joining the league in 2017. ↑ Participation vacated due to major NCAA violations. The Big Ten began sponsoring men's lacrosse in the 2015 season. The Big Ten lacrosse league includes Maryland, Michigan, Ohio State, Penn State, Rutgers, and Johns Hopkins, which joined the Big Ten conference as an affiliate member in 2014. The teams that compete in Big Ten men's lacrosse have combined to win 11 NCAA national championships. With the addition of Johns Hopkins and Maryland to the league, Big Ten men's lacrosse boasts two of the top programs and most heated rivals in the history of the sport. Johns Hopkins (29) and Maryland (24) combine for 53 NCAA Men's Lacrosse Final Four appearances. The media and both schools have called Johns Hopkins–Maryland rivalry the greatest and most historic rivalry in men's lacrosse. Since 1895, the two teams have matched up more than 100 times. Women's lacrosse became a Big Ten-sponsored sport in the 2015 season. The Big Ten women's lacrosse league includes Maryland, Michigan, Northwestern, Ohio State, Penn State, and Rutgers. Big Ten women's lacrosse programs have 21 of the 34 all-time NCAA championships, including 10 of the last 11. Maryland has won 13 NCAA national championships, including seven straight from 1995 to 2001 and most recently in 2015. Northwestern has claimed seven NCAA titles, including five straight from 2005 to 2009. Penn State has earned three pre-NCAA national titles and two NCAA titles in 1987 and 1989. Johns Hopkins became the seventh women's lacrosse program in the Big Ten as of July 1, 2016. This list goes through the 2014–15 season. The members of the Big Ten have longstanding rivalries with each other, especially on the football field. Each school, except Maryland and Rutgers, has at least one traveling trophy at stake. The following is a list of active rivalries in the Big Ten Conference with totals & records through the completion of the 2013 season. Penn State has a longstanding rivalry with Pittsburgh of the ACC, but the two schools have not met since 2000. However, the Penn State–Pittsburgh rivalry will be renewed with an alternating home-and-home series from 2016 to 2019. Penn State also has long histories with independent Notre Dame; Temple of The American; Syracuse, and Boston College of the ACC; and West Virginia, of the Big 12 Conference. Additionally, Penn State maintains strong intrastate rivalries with Patriot League universities Bucknell in men's basketball and men's lacrosse, and Lehigh in wrestling. Most of these rivalries were cultivated while Penn State operated independent of conference affiliation; the constraints of playing a full conference schedule, especially in football, have reduced the number of meetings between Penn State and its non-Big Ten rivals. Indiana has an out-of-conference rivalry with Kentucky of the SEC (see Indiana–Kentucky rivalry). While the two schools played in football for many years, the rivalry was rooted in their decades of national success in men's basketball. The two no longer play one another in football, but their basketball rivalry continued until a dispute about game sites ended the series after 2011. In the last season of the rivalry (2011–12), the teams played twice. During the regular season, then-unranked Indiana defeated then-#1 ranked Kentucky 73–72 at Assembly Hall. The Wildcats avenged the loss in the NCAA tournament, defeating Indiana 102–90 in the South Regional final in Atlanta on their way to a national title. Illinois has a longstanding basketball rivalry with the SEC's Missouri Tigers, with the two men's teams squaring off annually in the "Braggin' Rights" game. It has been held in St. Louis since 1980, first at the St. Louis Arena and since 1994 at the Scottrade Center. This rivalry has been carried over into football as "The Arch Rivalry" with games played at the Edward Jones Dome in St. Louis in 2002 and 2003 and four games in 2007 through 2010. Wisconsin has a long-standing, in-state basketball rivalry with Marquette. The series has intensified as of late with both teams having made the Final Four in recent years. The schools also played an annual football game before Marquette abandoned its football program in 1961. The school also has minor rivalries in basketball with the two other Division I members of the University of Wisconsin System, which include the University of Wisconsin–Milwaukee and University of Wisconsin–Green Bay. In the early days of the Big Ten, the Chicago–Michigan game was played on Thanksgiving, usually with conference championship implications and was considered one of the first major rivalries of the conference. ESPN Inc. – Big Ten football, basketball and volleyball air on ESPN and ESPN2, and sometimes on ESPNU and ESPN Classic. The conference's contract with ABC/ESPN also allows for the transmission of events through ESPN Mobile, ESPN3.com, and On Demand platforms. ↑ "University of Maryland and Rutgers University Become Official Members of Big Ten Conference". www.bigten.org. Retrieved 2016-06-21. ↑ "2014 Big Ten Academic Alliance University Data At-A-Glance" (PDF). Big Ten Academic Alliance. Retrieved 30 June 2016. ↑ Pizzo, Rick (March 2016). "Pizzo: Addition of Notre Dame strengthens Big Ten hockey". BTN.com. Big Ten Network. Retrieved May 31, 2016. ↑ "Athletics Visual Identity". University of Maryland-College Park. August 21, 2015. Retrieved August 21, 2015. ↑ "Colors:Applying the Brand: IU Brand Guidelines". Indiana University-Bloomington. August 21, 2015. Retrieved August 21, 2015. ↑ "Color Palette – The MSU Brand". Michigan State University. September 1, 2015. Retrieved September 13, 2015. ↑ "Ohio State Brand Guidelines". osu.edu. Retrieved 2015-01-13. ↑ "Penn State Graphic Arts Sheet" (PDF). psu.edu. 2011-05-15. Archived from the original (PDF) on September 25, 2015. Retrieved 2015-09-23. ↑ "Color Palettes – Identity Standards". University of Illinois at Urbana–Champaign. June 25, 2015. Retrieved August 21, 2015. ↑ "Colors – Guidelines and graphics for print and Web – University Brand Manual: Guidelines for Marketing and Communication". University of Iowa. August 21, 2015. Retrieved August 21, 2015. ↑ "Colors – University Communications". University of Nebraska-Lincoln. August 21, 2015. Retrieved August 21, 2015. ↑ "Color: Brand Tools – University Communications". Northwestern University. Retrieved October 27, 2015. ↑ "Purdue Brand Guidelines" (PDF). purdue.edu. 2012-02-08. Retrieved 2015-09-23. ↑ "College Navigator entry for Johns Hopkins University". National Center for Education Statistics. 2013. Retrieved September 16, 2013. ↑ "Color Palette | University Communications". Communications.uchicago.edu. Retrieved 2015-09-24. ↑ BIG TEN CONFERENCE Official Athletic Site – Big Ten Conference. Bigten.org. Retrieved on 2013-08-17. ↑ "Big Ten Announces Addition of Notre Dame Men's Ice Hockey as Sport Affiliate Member Beginning with 2017-18 Season" (Press release). Big Ten Conference. March 23, 2016. Retrieved June 1, 2016. ↑ Big Ten Announces Institution of Men's and Women's Lacrosse and Addition of Johns Hopkins as Men's Lacrosse Sport Affiliate Member – BIG TEN CONFERENCE Official Athletic Site. Bigten.org (2013-06-03). Retrieved on 2013-08-17. ↑ "BIG TEN CONFERENCE Official Athletic Site – Traditions". Bigten.org. Archived from the original on November 14, 2013. Retrieved 2012-11-07. 1 2 "Big Ten History". Big Ten Conference. Archived from the original on 13 January 2007. Retrieved 2007-01-14. 1 2 Canham, Don (1996). From The Inside: A Half Century of Michigan Athletics. Olympia Sports Press. p. 281. ISBN 0-9654263-0-0. ↑ STEVEN M. SIPPLE / Lincoln Journal Star. "Latest Husker News". HuskerExtra.com. Retrieved 2012-11-07. ↑ "CONFERENCE OUSTS MICHIGAN; Severs Relations with University for Non-Observance of Rules". The New York Times. April 14, 1907. ↑ "Four "Big Ten" Teams Undefeated". Lawrence Journal-World. November 16, 1917. ↑ "Chicago gives up Football as major sport". Gettysburg Times. December 22, 1939. Retrieved 25 November 2013. ↑ "Chicago U. Withdraws From Big Ten". Retrieved 2009-10-17. ↑ "An Ingenious Inception: Penn State Joins the Big Ten Conference". Archived from the original on 28 March 2007. Retrieved 2007-02-09. ↑ "Missouri Interested In Jumping To The Big Ten". January 16, 1993. Retrieved 2010-06-14. ↑ Sherman, Ed (1993-12-10). "Kansas, Big 10 a good fit?". Chicago Tribune. Retrieved 2009-11-10. ↑ Pamela Schaeffer (1999-02-19). "Notre Dame shuns Big Ten, fears losing `distinctiveness'". National Catholic Reporter. Retrieved 2007-01-14. ↑ Schlabach, Mark (June 9, 2010). "Expansion 101: What's at stake?". ESPN.com. Archived from the original on 12 June 2010. Retrieved June 11, 2010. ↑ "University of Nebraska Approved to Join Big Ten Conference by Council of Presidents/Chancellors". Big Ten Conference. 2010-06-11. ↑ "Big Ten Conference Reveals New Logo and Honors Football History with Division Names and Trophies". Big Ten Conference. Retrieved 2 April 2014. The new Big Ten logo was developed to symbolize the conference's future, as well as its rich heritage, strong tradition of competition, academic leadership, and passionate alumni", said Gericke. "Its contemporary collegiate lettering includes an embedded numeral "10" in the word "BIG", which allows fans to see "BIG" and "10" in a single word. Memorable and distinctive, the new logo evolved from the previous logo's use of negative space and is built on the conference's iconic name, without reference to the number of member institutions. The new logo also provides the flexibility of multiple versions which can be used horizontally, vertically and within new media. ↑ Ryan, Shannon (1 September 2010). "Big Ten sets new divisions; splits up Illinois-NU". Chicago Tribune. Archived from the original on 4 September 2010. Retrieved 6 December 2014. ↑ "Big Ten may rethink Legends, Leaders". ESPN.com. Associated Press. 17 December 2010. Retrieved 18 December 2010. ↑ Prewitt, Alex (November 19, 2012). "Maryland moving to Big Ten". The Washington Post. Retrieved 2012-11-19. ↑ Barker, Jeff; Korman, Chris (November 19, 2012). "Maryland's application for Big Ten admission approved". The Baltimore Sun. Retrieved 2012-11-19. ↑ "Rutgers University To Join The Big Ten Conference". Retrieved 20 November 2012. 1 2 3 4 Rittenberg, Adam (April 28, 2013). "Big Ten's divisional overhaul OK'd". ESPN.com. Retrieved April 28, 2013. 1 2 McMurphy, Brett; Rittenberg, Adam (April 19, 2013). "Sources: Big Ten to realign divisions". ESPN.com. Retrieved April 19, 2013. ↑ "Big Ten Announces Institution of Men's and Women's Lacrosse and Addition of Johns Hopkins as Men's Lacrosse Sport Affiliate Member". bigten.org. Big Ten Conference. Retrieved 3 June 2013. ↑ "Johns Hopkins men's lacrosse team to join Big Ten Conference". hub.jhu.edu. The Hub. Retrieved 3 June 2013. ↑ "Big Ten Announces Addition of Notre Dame Men's Ice Hockey as Sport Affiliate Member Beginning with 2017-18 Season". BTN.com. bigten.org. March 23, 2016. Retrieved June 12, 2016. ↑ "Big Ten Conference moves into Rosemont headquarters". DailyHerald.com. 2013-10-13. Retrieved 2014-03-28. ↑ "Big Ten relocating headquarters to Rosemont". DailyHerald.com. 2012-07-17. Retrieved 2014-03-28. ↑ Blackman-Doforno, Heather. "Big Ten Schools Considered "Public Ivies"". Tourtheten.com. Retrieved 2 August 2013. ↑ "Here's how Penn State stacks up among Big 10 schools in US News & World Report rankings". PENNlive. Retrieved 7 December 2014. ↑ "National Universities Rankings". U.S. News & World Report. Retrieved 7 December 2014. ↑ "Member Institutions and Years of Admission". American Association of Universities. Retrieved 2 August 2013. ↑ "Jim Delany: Nebraska the Packers of Big Ten – ESPN". Sports.espn.go.com. 2011-05-05. Retrieved 2012-11-07. ↑ "CoSIDA Academic All-Americans – Huskers.com – Nebraska Athletics Official Web Site". Huskers.com. 2012-06-21. Retrieved 2014-06-30. ↑ "Sharing Access to Courses". Cic.net. Retrieved 2012-11-07. ↑ "Reciprocal Library Borrowing – Introduction". Cic.net. Retrieved 2012-11-07. ↑ "Purchasing and Licensing". Cic.net. Retrieved 2012-11-07. ↑ "Name Change – FAQ". Big Ten Academic Alliance. Retrieved 30 June 2016. ↑ "Methodology". USA Today. May 10, 2013. Retrieved 10 November 2013. 1 2 "NCAA FINANCES". USA Today. Retrieved 23 April 2016. ↑ "Spending database". Knight Commission. Retrieved 4 December 2013. ↑ Big Ten Medal of Honor Winners Announced. June 8, 2011. Big Ten Conference official website. Retrieved 2011-09-09. "The award was established in 1914 .... In 1982, [it] was expanded to include a senior female athlete from each institution." ↑ Michigan Big Ten Sportsmanship Recipients. GoBlue (University of Michigan Athletics official website). Retrieved 2011-09-09. "In 2003, the Big Ten ... instituted the ... Sportsmanship Awards. ... [T]wo Outstanding Sportsmanship Award winners are selected from each school." ↑ Big Ten Records Book. Big Ten Conference official website. Retrieved 2011-09-09. ↑ Big Ten Championships (2001–present). Big Ten Conference official website. Retrieved 2011-09-09. ↑ Big Ten Conference Records Book 2013–14 (PDF). Park Ridge, Illinois: Big Ten Conference. 2013. pp. 26–27. Retrieved 2013-10-09. ↑ "Big Ten Announces Football Division Alignments and Move to Nine-Game Conference Schedules" (Press release). Big Ten Conference. April 28, 2013. Retrieved August 17, 2013. 1 2 McGuire, Kevin (July 31, 2015). "New Big Ten scheduling mandates Power 5 opponents, no FCS foes". NBCSports.com. College Football Talk. Retrieved July 31, 2015. ↑ McMurphy, Brett (September 22, 2015). "Independents BYU, Army, Notre Dame can fulfill Power 5 quota for Big Ten". ESPN.com. Retrieved September 22, 2015. ↑ "B1G to share Gator, Music City bowl tie-ins – July 18, 2013,". Retrieved 2013-12-08. 1 2 "Big Ten Extends Relationship with the Heart of Dallas Bowl and Adds the Bell Helicopter Armed Forces Bowl to the Rotation" (Press release). Big Ten Conference. July 23, 2013. Retrieved December 8, 2013. ↑ "Agreement expands Music City Bowl's potential participants' pool – July 18, 2013,". Retrieved 2013-12-08. ↑ "Kraft Fight Hunger Bowl to Feature Big Ten vs. Pac-12 Matchup Beginning in 2014" (Press release). Big Ten Conference. June 24, 2013. Retrieved December 8, 2013. ↑ "Big Ten Announces Partnership With New York Yankees and New Era Pinstripe Bowl" (Press release). Big Ten Conference. June 3, 2013. Retrieved December 8, 2013. ↑ "The Detroit Lions announce agreement with the Big Ten for Bowl Game at Ford Field" (Press release). Detroit Lions. July 17, 2013. Retrieved December 8, 2013. ↑ "Methodology". USA Today. November 6, 2013. Retrieved 11 November 2013. ↑ "USA TODAY Sports". USA TODAY Sports. Retrieved 2016-06-18. 1 2 3 "Sudler Trophy". John Philip Sousa Foundation. 2011. Retrieved January 27, 2011. ↑ Iati, Marisa (January 20, 2011). "Marching band wins prestigious award". The Observer. Archived from the original on January 22, 2011. Retrieved January 27, 2011. "Cullowhee's WCU band struts stuff in Rose Parade". Asheville Citizen-Times. January 2, 2011. Retrieved January 27, 2011. ... followed its 2009 win of the Sudler Trophy, the highest award for a university marching band. ↑ Official 2007 NCAA Men's Basketball Records Book (PDF). Indianapolis: NCAA. 2006. p. 241. ISBN 978-1-57243-909-2. Archived (PDF) from the original on 8 March 2007. Retrieved 2007-02-03. ↑ "Big Ten Men's Basketball History". Big Ten Conference. 2004. Archived from the original on 10 March 2007. Retrieved 2007-02-03. ↑ "Maryland Men's Basketball NCAA Tournament History". UMTerps.com. 2012. Retrieved 2013-09-28. ↑ Official 2007 NCAA Women's Basketball Records Book (PDF). Indianapolis: NCAA. 2006. p. 199. ISSN 1089-5299. Archived (PDF) from the original on 25 January 2007. Retrieved 2007-02-03. ↑ "Illinois Fighting Illini win NCAA men's gymnastics title – ESPN". Espn.go.com. 2012-04-21. Retrieved 2014-03-28. ↑ "Men's Ice Hockey To Be Recommended As Official Big Ten Sport Beginning With 2013-14 Academic Year". Big Ten Conference Official Athletic Site. Big Ten Conference. March 21, 2011. Retrieved 19 May 2013. ↑ "Big Ten Officially Announces Hockey Conference". College Hockey News. March 21, 2011. Retrieved 19 May 2013. ↑ "All-Big Ten hockey team announced". Big Ten Network. 2014-03-17. Retrieved 2014-04-20. ↑ "Big Ten Announces Institution of Men's and Women's Lacrosse and Addition of Johns Hopkins as Men's Lacrosse Sport Affiliate Member". Big Ten Conference Official Athletic Site. Big Ten Conference. June 3, 2013. Retrieved 1 March 2014. ↑ The Rivalry, Johns Hopkins Magazine, Johns Hopkins University, retrieved March 25, 2009. ↑ College Lacrosse's Biggest Rivalry: No. 7 Terps at No. 15 Johns Hopkins, University of Maryland, April 10, 2008. Archived March 3, 2012, at the Wayback Machine. ↑ David Ungrady, Tales from the Maryland Terrapins, p. 30, Champaign, Ill.: Sports Publishing LLC, 2003, ISBN 1-58261-688-4. ↑ "College Football Data Warehouse". Cfbdatawarehouse.com. Retrieved 2012-11-07. ↑ "History of NU's Rivalry Trophies". HailToPurple.com. Retrieved 2012-11-07.